Nebraska has won two titles in three years and made three straight Final Fours. That success was fueled by watching Penn State dominate the sport for eight years. Through 63 matches of NCAA Tournament action, Stanford led the nation in hitting percentage, but national champ Nebraska held foes to a tournament low .160 clip. The 2017 NCAA Tournament Final Four was a spectacular showing that broke the finals attendance record at the Sprint Center in Kansas City, Missouri. Plenty of chaos and upsets occurred in the second round of the NCAA Tournament this past weekend, as five nationally seeded teams were upended by unseeded opponents. That means 11 seeded teams still remain, the least to this point in the tournament in the past five events with 2013 being the last occasion. In last season’s NCAA Tournament, four unseeded teams cracked the Regional Semifinals in Arizona, Ohio State, Florida State and the tournament’s Cinderella darling in Creighton. That was one more than 2015 and 2014 when three made it through to the final 16 teams respectively in both years. That takes things back to 2013, the last time that this type of first/second round madness occurred. Just like this year, five unseeded teams made their way to this point in the tournament. Part of the reasoning comes from the Big Ten’s strength and depth as a conference. With so many strong teams, there are always a handful of unseeded Big Ten schools who are borderline top 15 or 25 teams but don’t have enough to host. Sure enough, this year three of the five unseeded teams in the Sweet 16 are from the Big Ten while two of the five in 2013 came from the conference. Another piece of the puzzle might be the NCAA Tournament committee’s over-dependence on the RPI. In some years, the RPI reflects pretty accurately the top teams, but in other years there are teams who everyone can tell is a top 16 team but doesn’t get to host with too low of that RPI. 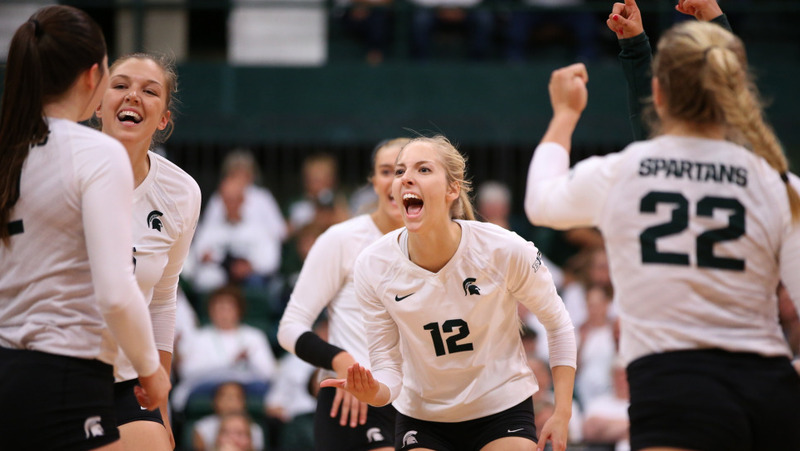 For instance, this season Michigan State was ranked 15th in the VolleyMob Top 25 Power Rankings and 12th in the AVCA Coaches Poll heading into the tournament, yet their RPI of 23 was a death certifcate for their hosting chances. Sure enough, they upended Creighton. As you can see, the Sweet 16 has been a bit of a buzzsaw to underdogs, whether its the increased competition, the extra week of preparation for the higher seed to not be caught off guard, that time lapse killing off some momentum or even pieces of each. That will be the true test to how crazy this tournament really is. They will have one, just like the last four tournaments, for sure as Michigan State takes on Illinois. After that, Missouri, Wisconsin and Colorado will have their hands full with top five seeds. Still, it’s been a great story with so many underdogs proving that the difference between some top seeds and non-seeded teams is not that wide of a margin and that anything can happen come NCAA Tournament time.